As soon as the weather got warmer, more precisely in the beginning of spring an Australian friend of mine who is a fan of my website (thanks Pete!) asked me to publish a barbecue recipe. I thought it was a great idea but it took me a couple of months to decide what I was going to make. After watching a video on how to prepare the perfect mouth-watering Brazil’s rump cap barbecue I immediately got inspired! Starting with the rump cap, in the next few weeks I will be posting barbecue-related recipes, including refreshing salads, sides and desserts, all inspired by Brazil’s world famous barbecuing style and my own family recipes. 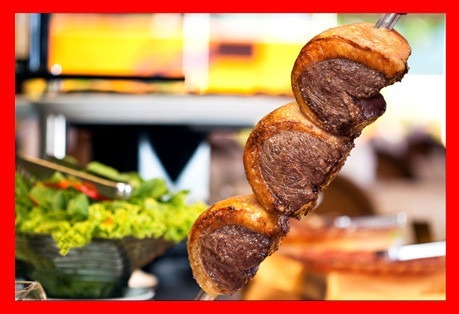 Rump cap or top sirloin cap is a prime beef cut very popular in Brazil known as picanha (pea-kan-yah). When cooked appropriately (rare or medium rare) this cut is incredibly tender, juicy and tasty. Because Brazilian beef cuts are different from Australian ones, rump cap is not a cut you will find easily at supermarkets – although I already saw them in large supermarkets in Brisbane. The best way is to ask your butcher to slice it for you. In Hobart I buy mine at West Hobart Gourmet Meats. Just show the chart below and explain that picanha (cut no. 8 – image source cozinhadadi.com) is the capping meat over the rump/top silverside and let them know they have to keep 1cm of fat layer. Notice the fat is extremely important as it enhances the flavour of the meat. Some Brazilians are so crazy about picanha that they even eat the fat! In order to have the authentic picanha cut only, you will have to cut the excess beef at home or ask your butcher to do it. This is how it’s done. From the narrower part count the three veins. You can easily locate the veins, just squeeze the beef with your fingers and a little blood will come out as per pictures below. Cut the beef exactly on the third vein, the excess beef can be frozen and used in other dishes. The picanha cut weighs usually no more than 1.1kg. Next the excess salt is removed and the meat is put fat up straight into the barbecue. The cooking time will vary depending on the type of your barbecue and how you like your meat (blue, rare, medium rare, medium, etc). For medium-rare results, the average cut of 1 kg takes approximately 25-30 minutes using a portable charcoal barbecue (American-style) or leave it until the fat swells. Next turn the fat down and barbecue for a further 15 minutes. Transfer to a plate, cover loosely with foil and let it rest for 15 minutes before slicing. Now for the accompaniments. 99.9% of Brazilian barbecues will have a crumb dish made with cassava flour, a couple of garden salads, a potato salad and plenty of mini Brazilian rolls which are called over there French rolls! Even though they are called ‘French’, they are purely Brazilian and very different from the French baguettes. These rolls are quite crunchy on the outside and super soft on the inside, perfect to have with some potato salad, a good smoky sausage or sliced barbecued steaks. I often hear Brazilians living overseas complaining they can’t find anything similar to the old (Brazilian) French rolls! Anyway, just have white shell rolls instead, that is probably the closest one can get outside Brazil. The green salad is a recipe of mine using local seasonal ingredients but feel free to have your favourite garden or green salad with this Brazilian barbecue. The salad is compulsory and it makes the meal lighter and more balanced. One of the most common desserts served after a Brazilian barbecue is called camelo which is a whole spicy and smoky barbecued pineapple. Camelo is so simple yet divine, serve it with a good-quality vanilla ice-cream for an extra pleasure. Words cannot describe how good this dish is. This is the perfect summer feast for Australians and barbecue lovers: it’s full of flavour, colours, vegetables, a crumb for a Brazilian touch, all wrapped up with a smoky pineapple and ice-cream. Perhaps some beer too? I can’t think of a way to make a barbecue lover feel happier than this! Oh, yes I know, a caipirinha lime cocktail as an appetiser can also add some fun to your backyard! Finally I can’t finish this post without talking about music. No Brazilian barbecue is complete without samba or MPB (popular Brazilian music). As a suggestion to your barbecue here are a couple of songs by two of my favourite singers, legend Elza Soares and Céu on Spotify. Enjoy the wonderful sunny days (or winter days if you are in the Northern Hemisphere)! More barbecue recipes coming soon. Order or buy the toasted cassava flour and cachaça in advance – online or from South American grocers. Print the list of ingredients above and check to see what ingredients you already got in your cupboard and fridge. Go shopping for all ingredients you don’t have including the meat and drinks, except the rolls. If necessary, include charcoal, firelighter, paper plates, cups and serviettes in your shopping list. Make sure you have plenty of filled ice-trays in the freezer or include a bag of ice in your shopping list. Place the drinks in the fridge. Prepare the mayonnaise dressing as per instruction item no. 2 and store it in an airtight container in the fridge. Cook the potatoes, carrot and snow peas and keep them in an airtight container in the fridge. Prepare the bacon crumb and store in an airtight container in the fridge. Heat it up in the microwave for a few minutes before serving or serve it at room temperature. Set aside all the cutlery, crockery, knives, boards and glasses. 1. For the Potato and Carrot Salad, place the potatoes in a medium saucepan, cover with plenty of water and bring to the boil over high heat. Cover the pan, reduce the heat to medium and cook the potatoes for 10 minutes. Add the carrot and cook the vegetables for a further 5 minutes or until potatoes and carrot are just cooked through, taking care not to overcook them. Drain and place in the fridge to cool. Peel the potatoes. Roughly chop the potatoes and carrot. 2. For the mayonnaise dressing, place the yolks, juice, mustard in a food processor or blender and process for a few minutes until all the ingredients are light and creamy. With the motor running gradually add the oil until the mixture thickens and gets pale. Season to taste. Keep it in an airtight container the fridge until ready to use. Just before serving stir in 100ml of milk to loosen it up and toss with potatoes, carrots and spring onions (scallions). 3. For the Speck Crumb, in a medium frying pan heat the olive oil over medium heat and fry the onion, stirring for 5 minutes or until soft. Add the speck and stir for 5 minutes or until crispy. Stir in chillies and garlic and fry for a further 2 minutes. Pour in the cassava flour and stir to combine. Stir in parsley and season with salt and pepper. Serve it warm or at room temperature. 4. For the Green Summer Salad, in a small frying pan heat the brown sugar, honey, salt over medium heat and cook for 3 minutes stirring continuously until the mixture is syrupy. Add walnut halves and gently toss through the caramel. Remove the walnuts and place in a single layer onto baking paper to cool. Cook the snow peas in boiling water for 2 minutes, drain and place in a bowl with iced water for a few minutes before draining again. Mix all the vegetables in a bowl. For the dressing, whisk all ingredients and pour over the salad just before serving. Garnish with walnuts. 5. For the Rump Cap, pre-heat your charcoal barbecue. Score the fat in angles taking care not to cut through the meat. Season the beef with rock salt on both sides, put them onto a plate and leave them to rest for 5 minutes so the salt is absorbed. Remove excess salt and barbecue the cuts fat side up for approximately 30 minutes (time varies depending on your barbecue) or until fat swells and changes colour slightly. Turn fat down and barbecue for a further 15 minutes. Transfer to a plate, cover loosely with foil and set aside to rest for 15 minutes. Remove foil, slice and serve immediately. 6. For the Barbecued Pineapple, brush the pineapples with cachaça (or rum) and sprinkle with cinnamon all over. Place in the barbecue and cook for about 20 minutes. Turn and cook for further 20 minutes or until caramelised. Serve with vanilla ice-cream. Vá às compras para adquirir todos os ingredientes que você não tem, incluindo a carne e bebidas, com exceção dos pães. Certifique-se que você tem bastante gelo no congelador ou incluia um saco de gelo em sua lista de compras. Se necessário, inclua guarda-napos de papel, pratos e copos descartáveis e carvão na sua lista de compras. Coloque as bebidas na geladeira. Prepare o molho de maionese conforme item 2 das instruções. Armazene em um recipiente hermético na geladeira. Cozinhe as batatas, cenouras e ervilhas tortas e armazene na geladeira. Prepare a farofa de bacon e guarde em um recipiente fechado na geladeira. Aqueça no microondas por alguns minutos antes de servir ou sirva à temperatura ambiente. Separe as louças, talheres, espetos e tábuas. 1. Para a maionese, coloque as batatas em uma panela média, cubra com bastante água e deixe ferver em fogo alto. Tampe a panela , reduza o fogo para médio e cozinhe as batatas por 10 minutos. Adicione a cenoura e cozinhe os legumes por mais 5 minutos ou até que as batatas e cenoura estejam cozidas, tomando cuidado para não cozinhar demais. Escorra e coloque na geladeira para esfriar. Descasque as batatas. Pique grosseiramente as batatas e cenoura. 2. Para o molho de maionese, coloque as gemas , o suco de limão, a mostarda em um processador de alimentos ou liquidificador e bata por alguns minutos até que a mistura fique cremosa. Com o motor em funcionamento gradualmente adicione o óleo até que a mistura engrosse e fique clarinha. Tempere a gosto com sal e pimenta. Mantenha-o em um recipiente hermético na geladeira até a hora de usar. Antes de servir misture com 100ml de leite para soltar. Misture o molho com as batatas , cenouras e cebolinha pouco antes de servir . 3. Para a farofa, em uma frigideira média aqueça o azeite em fogo médio e frite a cebola mexendo por 5 minutos ou até ficar macia. Adicione o bacon e mexa por 5 minutos ou até que fiquem crocantes. Adicione a pimenta e o alho e frite por mais 2 minutos. Despeje a farinha de mandioca e misture. Misture a salsa e tempere com sal e pimenta. Sirva a farofa morna ou em temperatura ambiente. 4. Para a salada, em uma frigideira pequena aqueça o açúcar mascavo , o mel , o sal e cozinhe em fogo médio por 3 minutos, mexendo continuamente até que o açúcar dissolva e comece a caramelizar. Adicione as nozes e misture delicadamente. Retire as nozes e coloque em uma única camada sobre papel manteiga para esfriar. Cozinhe as ervilhas tortas em água fervente por 2 minutos, escorra e coloque em uma tigela com água gelada por alguns minutos antes de drenar novamente. Misture todos os legumes em uma tigela. Para o molho, misture todos os ingredientes e despeje sobre a salada antes de servir. Decore com nozes. 5. Para picanha, acenda o carvão na sua churrasqueira. Usando uma faca bem afiada, faça cortes diagonais e superficiais na gordura, cuidando para não cortar a carne. Tempere a carne com sal grosso dos dois lados , coloque em um prato e deixe descansar por 5 minutos até que o sal seja absorvido . Retire o excesso de sal e coloque para assar na churrasqueira em uma altura de 40cm da brasa com a gordura para cima por 40-45 minutos (churrasqueira brasileira) ou até que a gordura inche e mude de cor ligeiramente. Vire a carne com a gordura para baixo e asse por mais 15 minutos . Transfira para um prato, cubra com papel alumínio (sem apertar) e deixe descansar por 15 minutos. Retire o papel, fatie e sirva imediatamente. 6. Para o camelo, pincele o abacaxi com cachaça e polvilhe com canela. Espete e asse por cerca de 20 minutos, vire do lado oposto e asse por mais 20 minutos ou até que caremelize completamente. Sirva com sorvete de baunilha. The rump cap looks delicious. Is there an optimum thickness to slice the piranha?? But you need a full on bbq pit for that. If you have one of those small mitre10 charcoal grills I recommend following the mentioned steps for optimal results.